The atom42 site has quite a few press links on its homepage. In fact, it’s starting to look a little cluttered. Well, there’s a secret to our online PR success, and that’s a certain media enquiry service that lets us know when there’s an opportunity to contribute our expertise to people who might find it useful, receiving some good media coverage in the process. Response Source is an enquiry service which lets journalists get in touch with PR people when they need a quote for one of their articles. 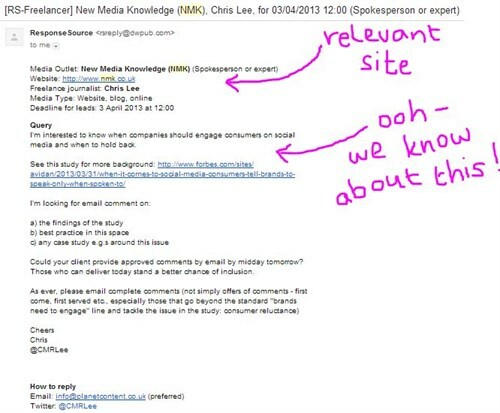 It can be useful for SEO as the resulting articles often contain links to the company they’re quoting. Even if there’s no link, recent Google algorithm developments make it more likely that simply having your company mentioned in the right context online, especially if it’s by an authoritative source, can help with SEO. Alternatives such as Gorkana and HARO offer a similar service, but Response Source is the one we’ve had the most luck with to date. Once you’re signed up, you’ll receive emails with requests from journalists. “I’m not surprised that 64% of consumers want companies to respond to social comments only when spoken to. There’s a fine line between helpful customer service and engagement and intruding on people’s private conversations – which can come across as pretty creepy. “Companies need to be careful not to act in an intrusive way, and engage with their consumers only when they’ve made it crystal clear that they’re interested in engaging, either by commenting on your Facebook post, replying to a Tweet or asking a direct question. Feel free to edit where necessary. As well as this appearance in NMK, we’ve had a range of successes with Response Source. Near the bottom of the atom42 homepage, you can click on the logos of The Times, FreshBusinessThinking, Fourth Source and Techbubbles to see examples of successful PR & links we’ve received. We’ve also had links from the Guardian and appeared in a somewhat risqué-sounding eBook – see if you can spot Andy’s face on the cover – by reacting to these notifications. One benefit of Response Source is that it allows you to narrow down the number of notifications you receive by choosing the category or categories most relevant to your industry. There are lots of categories available, from ‘Public Sector’ to ‘Farming & Animals’. Costs vary but tend to be a few hundred pounds for a year’s subscription, although you can get a one week free trial for most categories to test their relevance for your niche. Don’t worry if your success rate is quite low to begin with. Over time, you’ll start to get a feel for what type of requests are most relevant to your business, and how to increase your chances of being quoted. 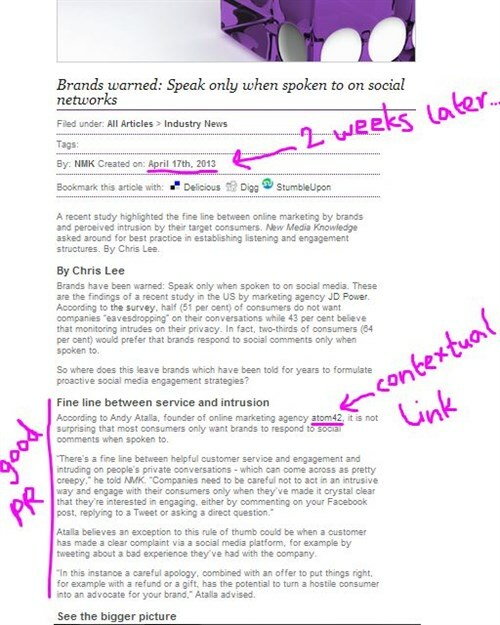 If you liked this article, you might also enjoy reading our top 5 online PR mistakes to avoid at all costs.